Lots of carnivorous plant news! The description of a new species of Nepenthes from the Phillipines hit the news – it’s called N. attenboroughii (after Sir David) . One of the discoverers wrote the Tepui book I mentioned a while back. Harvard’s Aaron Ellison and UVM’s Nicholas Gotelli are studying the ecosystems that function within sarracenia pitchers. “You’ve got four or five trophic levels in a pitcher plant, just like you’ve got four or five trophic levels in a lake,” said Ellison. Fly larvae are the top-level predator in the pitcher, the analogues of terrestrial tigers or wolves. They’re what ecologists call a “keystone” species, who control the abundance every other species, but require a habitat of sufficient size to support those other creatures. What’s the more important lure – color or sugar? Looks like color is irrelevant – at least in S. purpurea. The results suggest that nectar production is the crucial factor in determining prey capture success. 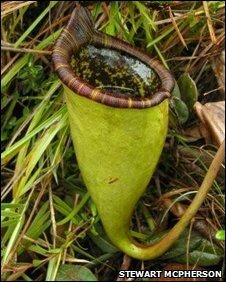 Real pitcher plants and pseudo-pitchers trapped nearly identical numbers of prey—357 versus 344 insects, respectively—while pseudo-pitchers without nectar caught far less. Both the real plants and pseudo-pitchers with nectar caught mostly ants. That’s good for the plants, as ants provide a much larger quantity of nitrogen than flies on a per-weight basis. The pseudo-pitchers without nectar caught mostly springtails, a different kind of arthropod.